I have a new game to share today: Piano Finger Twister! I’ve been wanting a floor staff for a long time. Now I finally have one! My Homeschool Class and my Piano Readiness Class both recently finished their Musical Instruments Workbooks. We usually complete just two pages each class, so it took us awhile to get through it! Now that we’ve finished it, we’ve been playing a fun little sorting/quizzing game using the deck of instrument cards that came with my MiniMusic kit. This competitive game has been quite a hit! This is a simple game to play with groups of students that makes note-naming flashcards a bit more interesting. 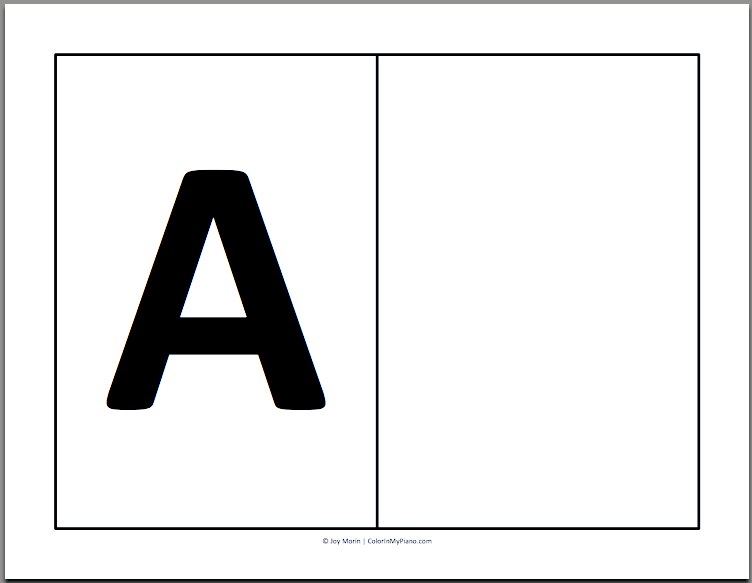 It involves sorting the flashcards onto alphabet letter signs on the floor, as pictured on the right (the “A” flashcards would go in the blank space on the right side of the page). The game is pretty flexible, because beforehand you can sort out exactly which flashcards you want to focus on with your students. This also allows you to control how long you wish the game to continue. You can also use different flashcards. With my Homeschool Music Class this week, we used my Piano Key naming flashcards (they came with the MiniMusic set I purchased earlier this year). With my Piano Readiness Class, we’ve been doing on-staff work so we used regular staff-note-naming flashcards (I use this set from Faber & Faber , but any flashcards will do). Another tip with this game: if you are using the note-naming flashcards, arrange the musical alphabet signs on the floor in a column, so that A is at the bottom and G is at the top. I recommend this because this arrangement resembles the staff, where the musical alphabet progresses vertically. If you are using piano-key-naming flashcards, I would arrange the signs on the floor horizontally, just like the keyboard. I found this game on D’Net’s Layton Music website. Basically, students “earn” their Halloween treat by clapping rhythms! When my students came to their lessons last week, we started with this game. They have to do as many “trick” (rhythm) cards as it takes until they draw a “treat” card. D’Net has the best game ideas. I definitely plan to reuse this next year! Occasionally, I like take a week off from my students’ normal theory book assignments so I can give them a supplemental worksheet targeting a specific skill, or simply so I can give them a just-for-fun worksheet! 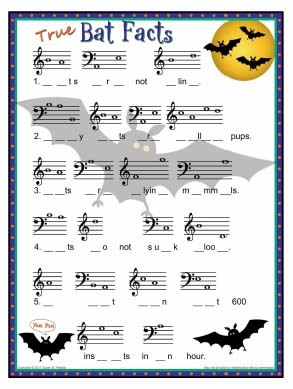 Susan Paradis’ Bat Facts worksheet is perfect for a just-for-fun worksheet, while giving students a chance to review identifying note names on the staff. Plus, students get to learn some true fun facts about bats! Happy Halloween to you all! What activities did you plan? You’ll notice I have more than one beanie animal for “C”. I simply couldn’t make up my mind. Before I begin, allow me to give credit where credit is due for this wonderful idea: I got this idea from Laura on her blog (click here). 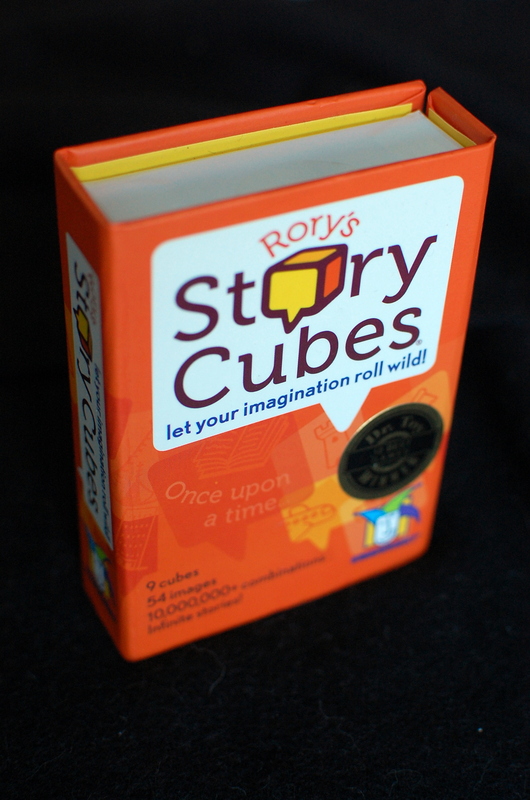 I was so thrilled to see her idea of using these “story cubes” for improvisation with piano students! 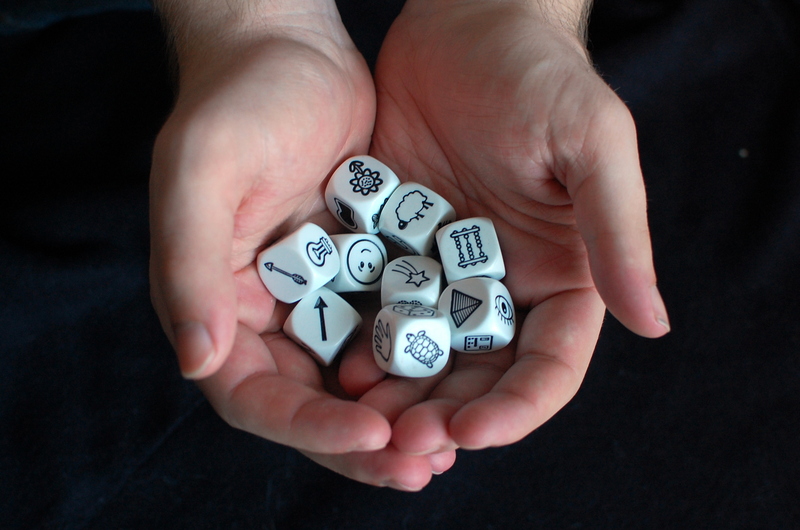 Rory’s Story Cubes consist of a set of 9 dice with all kinds of pictures on their faces. I think English teachers use these as a starting point for writing stories. Let me tell you about how I’ve been using this fun new prop. Hands-On Beats the Visual….Hands Down! My colleague Loretta and I have been teaching a pair of beginner students in a group setting each week. Last week, we were learning about 3/4 and 4/4 time, and quarter notes and half notes. Loretta and I wrote rhythms on the whiteboard, asked the students to help us write in bar lines, and then clapped and counted the rhythms together. While this activity worked and was beneficial, what we did this week was much more successful. On Anne Crosby Gaudet’s website, we discovered her wonderful Music Discoveries Rhythm Blocks pdf. The pieces are easy to print and cut out. In class today, our two beginners were so excited to make their own rhythms and try clapping them. With Ann’s rhythm blocks, it’s easy to tell how many beats each note gets! Click here and scroll down to view Ann’s printable on her website. 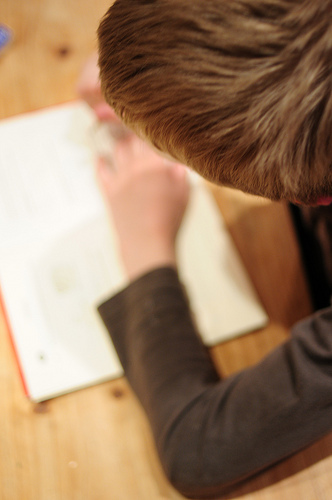 What kinds of hands-on activities have you discovered for your students lately?